The T-Max® 3W/G2™ can operate as a stand-alone timer or be controlled from the front desk. Up, Down, and Start/Stop buttons allow for easy control of your tanning bed. Terminals that screw down provide flexible and easy wire connections. All parameters, such as lamp hours, session counts, bed hours, etc. can be accessed and changed right on the T-Max® 3W/G2™. All these features provide an easy to install and inexpensive way to control a tanning bed from the front desk of your salon. Up to eight T-Max® Manager/Pro and/or T-Max® Manager G2s™ can be connected to a single salon. The T-Max® 3W/G2™ is also wireless ready. It can connect to a G2™ Access Point to communicate throughout your tanning salon without the need to run cables throughout your salon. 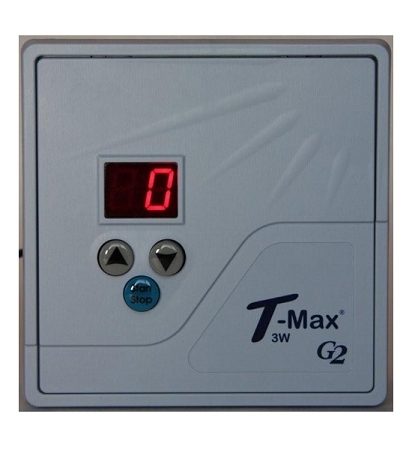 The T-Max® 3W/G2 ™can be used as an independent timer, or can be used as a front desk controller to control another T-Max® timer in the tanning room for remote single bed control. The T-Max® 3W/G2™ at the front desk will control the T-Max® timer in the room; whether it's another T-Max® 3W/G2™ or a T-Max® certified timer in the tanning bed.